Ah, the humble zip tie. Originally invented in 1958 as a cable harness on airplanes (according to Wikipedia, anyway), the zip tie is useful for everything from fixing your kid’s bike to exploring Mars. Zip ties have applications in fly-fishing, too. A friend of mine from Arkansas used zip ties clamped around twin pairs of holes in the bottom of a Rubbermaid bucket to make “fingers” for a very passable shooting basket. This same friend suggested using zip ties to fix my broken boot grommets. Over time, some commercial metal boot eyelets or grommets can weaken and fail, but often the boot has many years of hard work left. 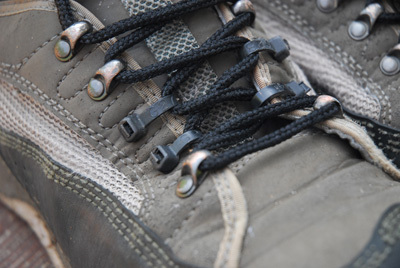 Rather than running the laces through the naked cloth eyelet, make a small zip-tie loop instead, then run your laces through that. It’ll decrease the stress on the fabric while still giving you enough slipperiness to cinch the boot. In fact, my favorite pair of wading boots has very few eyelets left, and I’d swear they’re more reliable with their zip-tie replacements. Do you know of a creative use for zip ties–or other household goods–in fly fishing? Share it with us in the Comments section!